While everyone may want to grab the plate of crudites (raw carrots, celery, etc. ), a chip craving cannot be satisfied with a raw vegetable. Chips can offer such a satisfying crunch. Whether eaten on their own or enjoyed with a dip, chips can be a side, snack or, for some, an entire meal. Still, for those who want to eat more healthy, chips can derail many calorie or other restrictive diets. What if you could enjoy a chip that falls into a healthy lifestyle choice. Real Deal Veggie Chips are that option. Real Deal Veggie Chips could be considered the ideal chip. Made with 51% real green peas, corn and rice, each ounce contains a serving and a half of vegetables. Available in three varieties, original sriracha and aged white cheddar, one flavor will fit any situation. Plus, the Real Deal Veggie Chips are gluten-free, kosher, and non-GMO. For those who are calorie conscious, these chips offer 80% less fat than potato chips. Unlike other chip substitutes, the Real Deal Veggie Chips have a texture similar to a potato chip. The chips super crunchy with tons of flavor. These chips can pair perfectly with a french onion dip, hummus or any dip that you prefer. While the original flavor is delightful, the other flavors add wonderful variety. The aged cheddar chips will appeal to anyone who loves white cheddar mac n' cheese. For the spicy connoisseur, the sriracha offers a tangy Asian flare without overwhelming your taste buds. 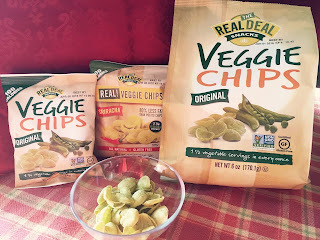 In the Chicago area, Real Deal Veggie Chips are available at Sunset, Roundy’s/Mariano’s, Strack & Van Til, Walts, Woodmans, Pete’s, Caputo’s, and Tony’s. The Real Deal Veggie Chips are sold in 6 ounce bags and 100-calorie 6 packs. Keep your promise for a better you for the new year but don't cut out all the things that you love. With Real Deal Veggie Chips, you can enjoy the chips without the chip guilt. Disclosure: The writer received these products to try. This post reflects the writer's opinions and thoughts. These chips look really good. My daughter is a vegetarian so I am always looking for great foods for her. I never realized that the fat that many chips are cooked in is from beef or pork. I will let her know about these and check them out.